If you visit a foreign country, you will need to decide when, where and how you will convert your travel money to the local currency. You will need to take several factors into account, including exchange rates and fees. The currency exchange rate tells you how much your money is worth in the local currency. When you exchange your money, you are actually using it to buy or sell foreign currency at a specific price, which we call the exchange rate. You can find the exchange rate by using a currency converter, reading signs at banks and currency exchange companies or by checking a currency information website. A currency converter is a tool that tells you how much a given amount of money is worth in foreign currency at today's exchange rate. It will not tell you about fees or commissions you might pay to exchange your money. There are several types of currency converters. X​e.com is easy to use and packed with information. Alternatives include Oanda.com and OFX.com. Google's currency converter is bare-bones, but it works well. Xe.com offers free currency converter apps for iPhone, iPad, Android, BlackBerry, Windows 8 and Windows Phone. Xe.com also provides a mobile currency site which will work on any mobile device with Internet connectivity. Oanda.com and OFX.com also offer mobile apps. You can buy a hand-held device that converts one currency to another. You will need to input the currency exchange rate each day in order to use the converter. Currency converters are handy for checking prices in shops and restaurants, and they do not use smartphone data. The only information you have to enter is the currency exchange rate. You can use your mobile phone's calculator to figure out the cost of items in your home currency. You will need to look up the exchange rate to do this. For example, suppose an item is for sale for 90 Euros and the Euro to US dollar rate is $1 = 1.36 Euros. Multiply the price in Euros by 1.36 to get the price in US dollars. 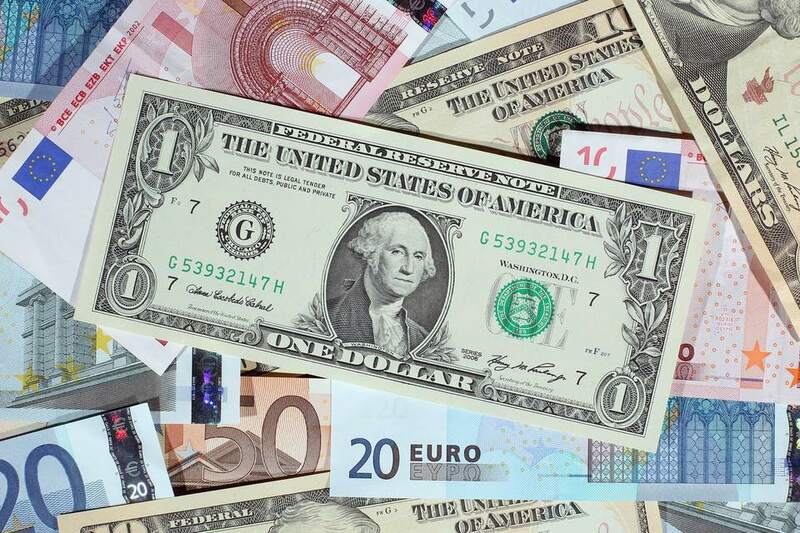 If your exchange rate is, instead, expressed in US dollars to Euros, and the exchange rate is $0.73 to 1 Euro, divide the price in Euros by 0.73 to get the price in US dollars. When you exchange your money, you will see two different exchange rates posted. The "buy" rate is the rate at which a bank, hotel or currency exchange office will sell you their local currency (they are buying your currency), while the "sell" rate is the rate at which they will sell you foreign (your local) currency. The difference between the two exchange rates is their profit. Many banks, currency exchange offices and hotels also charge a service fee to exchange your money. Exchanging currency is not free. You will be charged a fee, or group of fees, each time you change money. If you get foreign currency from an ATM, you will be charged a currency conversion fee by your bank. You may also be charged a transaction fee, as you would at home, and a non-customer / non-network fee. Similar fees apply if you use your credit card in an ATM to obtain a cash advance. Fees vary by bank and currency exchange office, so you might want to spend some time comparing fees charged by the banks you normally use. Where Can You Exchange Your Currency? There are several places you can exchange currency, depending where and when you travel. If you have an account with a large bank, you may be able to order foreign currency before you leave home. Transaction fees for this type of currency order can be high, so do some math before deciding to order currency from your bank. You can also buy foreign currency in cash or on a prepaid debit card from Travelex. This can be an expensive option, as you will not get the most favorable exchange rate. You will have to pay a delivery fee if you have Travelex send the cash or card to your home or departure airport. Most large and medium-sized airports, as well as some seaports, offer currency exchange services (often marked "Bureau de Change") through Travelex or another retail foreign exchange firm. Transaction costs tend to be higher at these currency exchange offices, but you should consider exchanging a small amount of money at your arrival airport or seaport to tide you over until you can find an ATM or bank. Otherwise, you may not be able to pay for your ride to your hotel or for your first meal in-country. Some large hotels offer currency exchange services to their guests. This is often an expensive way to exchange money, but you may find yourself grateful for this option if you happen to arrive in your destination country on a day when banks and currency exchange offices are closed. Tell your bank about your upcoming trip before you leave. Be sure to give the bank a list of all the countries you plan to visit. This will prevent your bank from placing a block on your account because your transaction pattern has changed. If you plan to use a credit card issued by a credit union or other institution (e.g. American Express), contact that credit card company, too. While withdrawing large amounts of cash from an ATM will cut your total transaction costs significantly, you should never carry that cash in your wallet. Invest in a comfortable money belt and wear your cash. Be aware of your surroundings as you leave an ATM or bank. Thieves know where the money is. If possible, visit banks and ATMs during daylight hours. Bring a backup credit card or a prepaid debit card in case your primary form of travel money is stolen or lost. Save your receipts. Carefully check your bank and credit card statements when you return home. Call your bank immediately if you notice any duplicate or unauthorized charges.